Sunday, September 15th appeared to be shaping up as our perfect weather day to strike out for Mount Katahdin. We had patiently waited during a couple days of foggy, drizzly weather... but no more! Being camped at Nesawadnehunk Campground, we knew we had to get an early start if we wanted to park at Roaring Brook Campground to ascend the Chimney Pond trail. We left the campground at 4:50 AM for our 1 hour drive on the gravel tote road to get to the other side of the park. In case you don't know, the Togue Pond Gate southern entrance to the park opens at 6 AM. If we didn't get past the gate before it opened to folks waiting to get in the park, we'd be sunk. We passed the gate ataround 5:30 and saw that there were already cars lined up waiting to get in. Since we were already in the park, we didn't have to wait at the gate, we just had to move about the park to get to where we wanted to be. There are lots of rules in this park so be sure to read them when making your plans so you aren't disappointed. One big rule is that no dogs are allowed in the park. There are also many rules about camping and day use parking. We arrived at the Roaring Brook Campground at about 5:50 AM. We got our gear out of the car and sat down at a picnic table to eat breakfast. Soon the cars began streaming in and the parking lot was nearly full by the time we signed in at the Ranger Station to begin our hike. It was 6:45 AM. The sun was already coming up and it promised to be a great day. Lots of folks were heading towards Chimney Pond. Some were only heading to the pond, while others intended to climb Katahdin. Some people were well prepared, and others didn't have a clue. The ranger was doing her best to stress how difficult the climb would be, and what gear was essential. We headed out on the Chimney Pond Trail. It's about a 3.5 mile hike to Chimney Pond with a steady moderate uphill grade. We reached the pond and the nearby ranger station after about 1.75 hours. The ranger asked us our plans and he had some good advice. Leesa didn't want to climb the knife edge so we discussed our options. 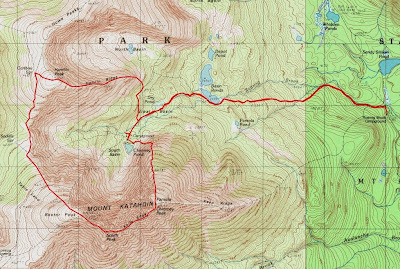 The ranger suggested that I climb the Dudley Trail and Leesa climb the Saddle Trail and we could meet on or near the summit of Baxter Peak. It was a plan that worked well. I set off on the Dudley Trail and almost immediately hit the large boulders that one has to climb over. It was pretty cool but Leesa wouldn't have liked it. The grade was steep for the first 2/3 of the trail and then became easier near the top. I lost my favorite baseball cap on the way up. A gust of wind caught it, and it was gone. I looked for it for a couple minutes, but it must have sailed quite a ways. The Dudley trail ends on the summit of Pamola Peak. The views everywhere were incredible from pretty early on in the Dudley Trail for most of the rest of the day. I stopped on Pamola for a few minutes to enjoy the scenery, but I was excited to be heading for the Chimney and the Knife Edge. I had to wait behind a pair of other hikers who were having a little trouble negotiating the Chimney. Once around them I climbed the Chimney and headed out onto the Knife Edge. I only found there to be one or 2 spots that were a little scary, but then again, I was there on a dry day with no wind. I would not attempt the Knife Edge in anything less than near perfect conditions. Also if you are afraid of heights or exposure, this is not the trail for you. At one point you are on the side of the crest on a narrow ledge and have to lean into the rock and not look down. There is also a couple points where the ridge is only a couple feet wide and it drops steeply on both sides. There were quite a few people out on this fine weather day and I probably passed 20 people between Pamola and the Knife Edge. The Knife Edge gets easier as you continue to head towards South Peak. It took me an hour to climb the Dudley Trail to Pamola and then another hour to cross the Knife Edge and get over South Peak to the summit of Baxter. I sat on Baxter Peak for about 10 minutes and didn't see Leesa coming up from the Saddle so I started down Baxter towards the Saddle. I only hiked for a couple minutes before I saw her coming. We returned to the summit of Baxter so she could claim the peak also. We sat on the summit for awhile and watched as a large group was reaching the summit as they were completing the Appalachian Trail. What a climax! They were whooping it up and rightfully so. We then headed towards the Tablelands. We were both feeling good so we decided to continue on towards Hamlin Peak where we could then descend the Hamlin Ridge Trail. The Tablelands is a beautiful spot. Its basically a high plateau but I can't think of another place that feels like it does. From the Tablelands, we had a good view of the mountains we had climbed the day before: North and South Brother and Mount Coe. We passed the junction with the Saddle Trail and continued on. The climb up Hamlin Peak was easy, with only an elevation gain of 400-500 feet. We had a few clouds pass by as we were climbing Hamlin, but they went away and the sun remained for the balance of the day. You can tell from the photographs. It was just a perfect day to be outside. We summited Hamlin at about 1:30 PM. We stopped and had some more food before starting the descent. Once off the Hamlin Ridge Trail, we expected a typical trek out through the forest on the Chimney Pond Trail. We were in for a surprise. As we get to Basin Ponds, there was a bull moose and a cow moose on the shore eating grass beside the pond. We took some pictures, then Leesa went around the other side and walked to the water's edge to get closer pictures. She didn't see the moose and she then turned around and it was about 20 feet from her with it's back to her. She took a couple pics and slowly backed out! What a way to cap a perfect day! I must say that this is one of may favorite trips of all time. The combination of the scenery, the weather, the moose and having this great hike with Leesa was just perfect. If you get the chance to go to Katahdin, don't miss it. Hopefully you'll get to see it in the clear weather like we did. It's an awesome place. If you want to see more pictures from this trip, the link to my Picasa web album is here. Impressive; glad you were successful! Thanks! We had an equally good time at Acadia, hiking and sea kayaking. I'll get those trip reports up in the next couple days. Thanks. I'll be back there soon. 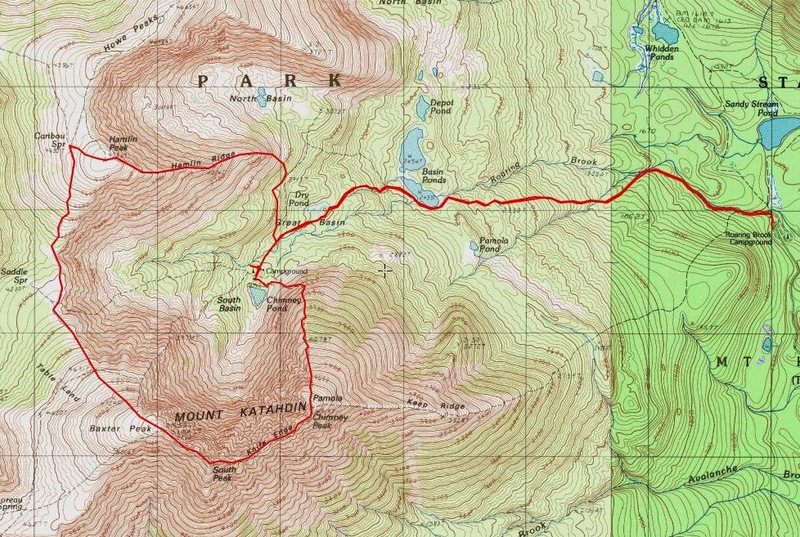 I want to do the Helon Taylor trail and also explore the Howe Peaks area to the north of Hamlin Peak.